By Mateusz Mucha and Wojciech Sas - PhD candidate. This kinetic energy calculator is a tool which helps you assess the energy of motion. It is based on the kinetic energy formula, which applies to every object in vertical or horizontal motion. What the relation between dynamic pressure and the kinetic energy equation is. The kinetic energy of an object is the energy that it possesses due to its motion. It is defined as the work needed to accelerate a body of a given mass from rest to its stated velocity. Having gained this energy during its acceleration, the body maintains its kinetic energy unless its speed changes. The same amount of work is done by the body in decelerating from its current speed to a state of rest. Kinetic energy is the energy of an object in motion. It defines how the mass of an object influences its velocity. Let's take an example. If you put the same engine into a lorry and a slick car, the former is not able to achieve the same speed as the latter because of its mass. You can easily find it out by using kinetic energy calculator. With the kinetic energy formula, you can estimate how much energy is needed to move an object. The same energy could be used to brake the object, but keep in mind that the velocity is in the second power. It means that even a small increase in speed changes the kinetic energy by a relatively high amount. 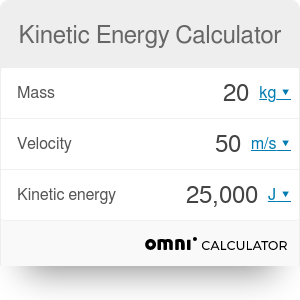 How about you give our kinetic energy calculator a try? This tool will make the calculations for you after typing the mass and velocity of an object. If you don't know the speed of the object, you can easily calculate it with our velocity calculator. You should be aware, however, that this formula doesn't take into account relativistic effects, which begin to be noticeable by higher speeds. If an object is moving faster than with 1% of the speed of light, you should use our relativistic kinetic energy calculator. All of these kinetic energy units can be easily converted into one another with the following ratios: 1 J = 0.7376 ft·lb = 6.242·10¹⁸ eV = 0.239 cal = 2.778·10⁻⁴ Wh. As you can see, depending on the scale, they may differ by a significant number of orders of magnitude, so it's convenient to use scientific notation or express them with some prefix like kilo- (kcal, kWh), Mega- (MeV), etc. Anyway, you shouldn't bother with units while using kinetic energy calculator. You can choose whichever you like, and the value will be immediately converted. Potential energy refers to the gravitational pull exerted on an object, relative to how far it has to fall. When the object gains altitude, its potential energy increases. If you want to check what potential energy is and how to calculate it, use our potential energy calculator. It turns out that kinetic energy and work done over the system are strictly correlated, and their relation can be described by the work-energy theorem. It states that the work caused by all external forces is converted into the increase of widely understood kinetic energy. W = ΔKE = KE₂ – KE₁. Vibrational kinetic energy - can be visualized when the particle moves back and forth around some equilibrium point, approximated as harmonic motion. Depending on the structure it can be shown as stretching, twisting, or bending. At the microscopic scale, all of these kinetic energy examples are the manifestation of thermal energy which increases with the temperature rise. p = ρ * v² / 2. It looks very similar to the kinetic energy equation because mass is replaced by the density, and it isn't a coincidence. The other name of the dynamic pressure is the kinetic energy per unit volume, and analogically, density is defined as mass contained in particular volume. With a little degree of imagination, you can use our kinetic energy calculator to estimate the dynamic pressure of a given fluid. If you replace mass in kg with density in kg/m³, then you can think about the result in J as a dynamic pressure in Pa. Some of the highest energy particles produced by physicists (e.g., protons in Large Hadron Collider, LHC) reach the kinetic energy of few TeV. It is said to be comparable with the kinetic energy of a mosquito. It's impressive when you realize what an enormous number of molecules is there in one insect. However, if we work out the value in joules, then the outcome is in the order of 1 μJ. In that meaning, the particle which reaches 1 J is extraordinarily high-energy and surely not available for humanity to be produced in the nearest future. Let's consider a bullet of mass 5 g traveling at the speed of 1 km/s. Its kinetic energy equals 2,500 J, way above 1 J because of the considerable velocity. That's the reason why bullets cause a lot of damage while reaching targets. Use the kinetic energy calculator to find that the same bullet will drop its energy to 1 J when it is decelerated to the velocity of 20 m/s. Well, it still can hurt when it impacts the body, but definitely won't cause more severe damage than a bruiser. The ship weighs 50,000 tons and can move at the speed of 10 knots. We can always use speed converter to find that it's around 5.1 m/s. Its kinetic energy is then circa 661 MJ. That number is obtained mainly because of its impressive mass. Mateusz Mucha and Wojciech Sas - PhD candidate. Kinetic Energy Calculator can be embedded on your website to enrich the content you wrote and make it easier for your visitors to understand your message.